The Great Park Balloon is the Orange County Great Park’s iconic attraction. With the ability to hold up to 25–30 passengers and soar 400 feet above the surrounding landscape, it serves as a public observation deck for the Great Park’s development and offers an unmatched 360° view that spans 40 miles on a clear day. For up-to-date ticket information and weather-related flight availability, call the Visitors Center at 949-724-6247. Thursday–Friday: 10 a.m.–3 p.m.; 7 p.m.–10 p.m.
Saturday–Sunday: 9 a.m.–3 p.m.; 7 p.m.–10 p.m.
*Children younger than 13 must be accompanied by an adult on Balloon flights. Parking opens 30 minutes before operating hours. Registration begins 30 minutes before operating hours in the morning, and one hour before night flights resume in the evening. A registration waiver (available at the Visitors Center) must be signed by every potential passenger prior to getting a boarding pass. A parent or guardian must sign for children younger than 18. Children younger than 13 must be accompanied by an adult. Please note: Registration is on a first-come, first-served basis and does not guarantee balloon flights, as all rides are weather permitting. There are no age, height, or health restrictions to fly on the Great Park Balloon. The Balloon is wheelchair accessible, allowing guests with wheelchairs and Electric Convenience Vehicles (ECV) to remain in their seat during flight. Should a wheelchair or ECV exceed the maximum dimensions permitted (25″ wide by 48.5″ long), the options to transfer to a standard wheelchair or folding chair are available at the Visitors Center. The Great Park Balloon is one of the largest tethered helium (not hot air) balloons and the first of its kind in the United States. It is environmentally safe, non-polluting, and virtually silent. Standing 118 feet tall with a volume of 210,000 cubic feet, the Balloon can hold up to 30 passengers in its 1,810-pound gondola. Flying at an altitude up to 400 feet, it is always tethered to the ground by a steel cable with the strength of 99,000 pounds, making it a safe and fun experience for everyone. An Orange County tradition, updated with vintage-inspired scenic artwork, is a favorite for kids of all ages. For larger groups, a Family & Friends pass is available for either Great Park Balloon or Carousel rides. Visitors can purchase four adult Balloon flights and receive a fifth adult Balloon flight free (five adult Balloon flights for $40). 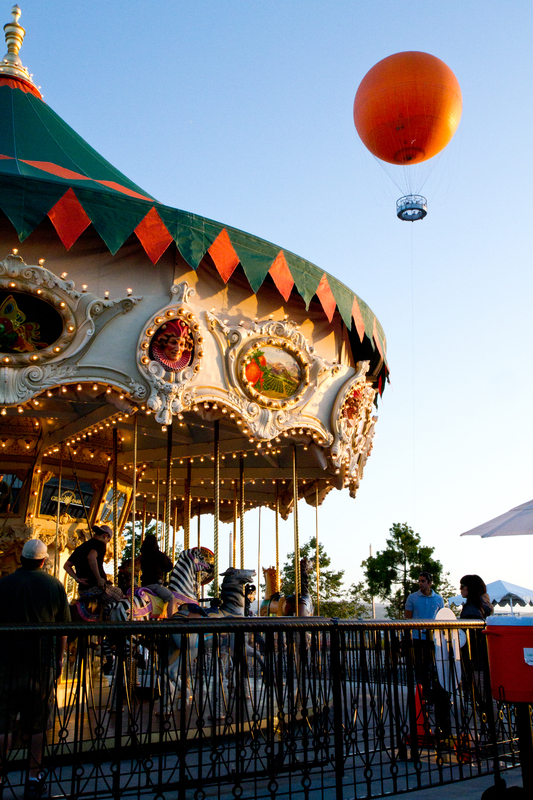 Visitors can also purchase 10 all-day Carousel rides for $20 (savings of 30 percent on all-day pass). Please note: Balloon and Carousel hours may vary on holidays. For hours, directions, and park maps, visit ocgp.org/maps. For questions, contact the Visitors Center at 949-724-6247.